Ive always been fascinated with RC helicopters, and helicopters in general. What mass-produced helicopter (minimum 250 made), civilian or military, any country of origin, has the longest range? And, assuming the helicopter was designed to be outfitted with additional fuel tanks and those tanks were installed and used. Helicopters that have mid-air refueling capabilities extending the range would count, but assume that mid-air refueling is not done and the longest range is based upon only one initial fully fueled helicopter. Longest range in miles or in hours of airtime? For long range, people use an airplane to get to where the helicopter is. Then they use its unique abilities to get the job done at short range. Few choppers are designed with range in mind, apart from a few servicing the offshore market. With a special fuel tank, our A109 had a range of 400nm with 20 min reserve. ok, what type of helicopter services offshore rigs? Gurgle it up. S92, big Airbus/Leonardo. But range is a secondary consideration, the primary one is lifting a load of rig pigs off a platform. The UH-60 Blackhawk equipted with the External Stores Support System has a range of 1200 miles. Hughes OH-6 has the record at 1900nm unrefueled, but they added ferry tanks to do it. Edited by SBuzzkill, 15 April 2019 - 20:38. 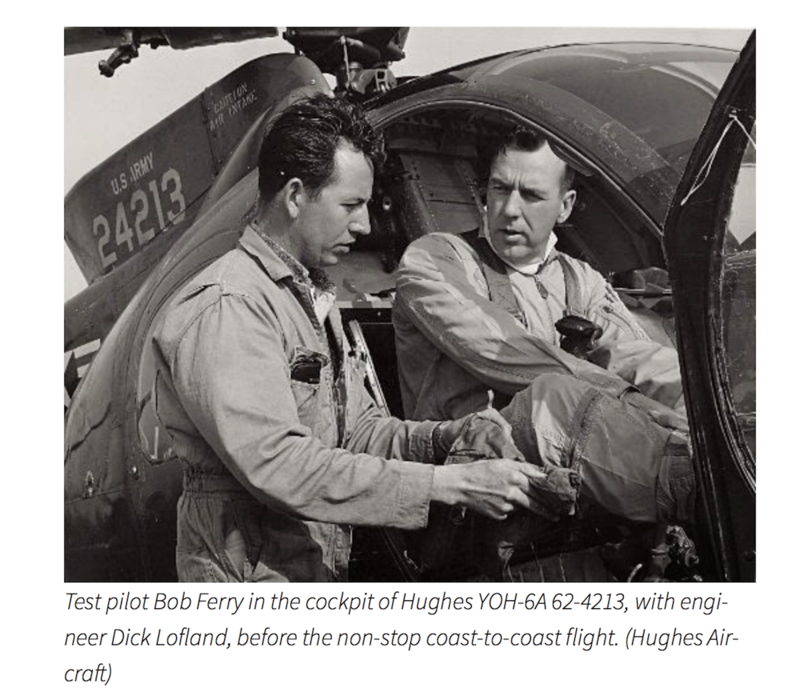 April 1966: Chief Test Pilot Robert G. Ferry of Hughes Tool Company’s Aircraft Division flies the number three prototype YOH-6A, 62-4213, from the company airport at Culver City, California, non-stop to Ormond Beach, Florida, a distance of 3,561.55 kilometers (2,213.04 miles). Bob Ferry set three Fédération Aéronautique Internationale (FAI) World Records for Distance Without Landing.¹ All three records still stand. Edited by iChris, 17 April 2019 - 10:58. Ohhhhhhh, that must be where the term "ferry flight" came from! And that story is incredible, Bob Ferry was a beast.